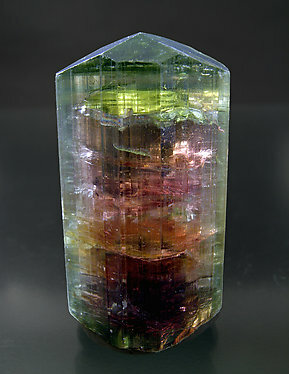 The crystal is completely transparent, very bright and it has a wide variety of color shades that form soft gradations. The group of terminal faces is exceptionally sharp and neat, showing the three faces of rhombohedron perfectly equilibrated with the pinacoid. A floater crystal whose base is recrystallized. It has beautiful color zones, with a clear contrast between the inner red zone and the skin which varies from green to yellow. The lower termination is especially complex. A floater crystal whose base is partially re-crystallized. It has beautiful color zones, with a clear contrast between the inner red zone red, and the skin which varies from green to yellow. The lower termination is especially complex. 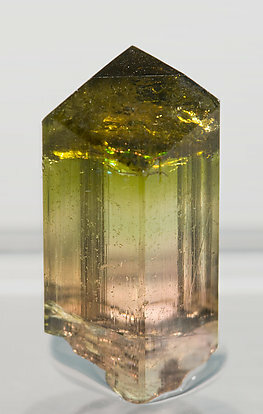 Sharp prismatic crystal with very well defined faces and edges terminated by the three typical faces of a very flattened rhombohedron. It has deep mauve color with orange reflections and has a very well defined phantom. 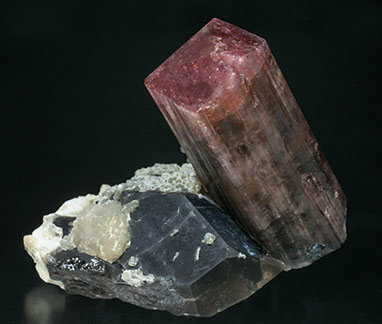 Divergent group of prismatic crystals terminated by three faces of a flat rhombohedron. Color and luster are exceptional. We’ll give a copy of analysis to the buyer. The specimen is extraordinary, both for its characteristics and for its size. The crystals form a slightly divergent group, are prismatic and are terminated by the three faces of a flat rhombohedron. Color and luster are exceptional and so is the transparency. 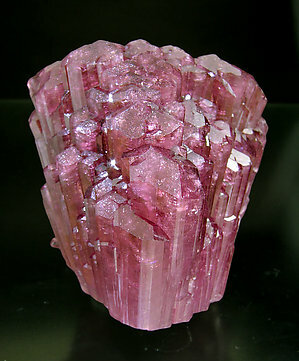 This prismatic crystal has an extraordinarily intense color, red with mauve shades. It has a magnificent definition of faces and edges and also magnificent are the luster and transparency. 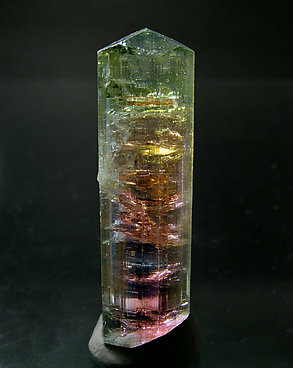 A single crystal with very well marked parallel growths and very well defined terminal faces. 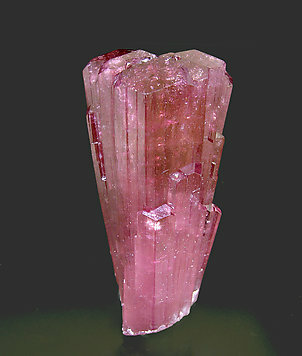 It is transparent with a slightly orange color and pinkish and mauve shades and color zoning perpendicular to the main direction of the crystal. 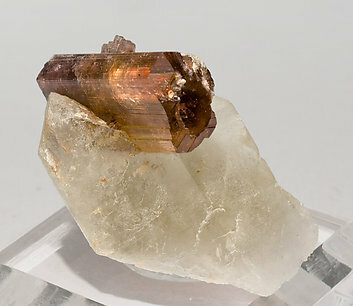 The matrix is a smoky Quartz crystal. 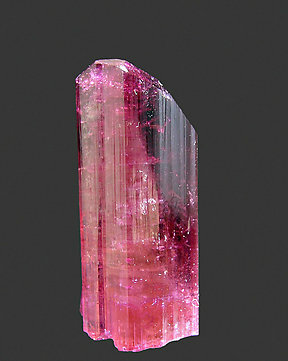 A dominant crystal with very well defined faces and edges, formed by the ditrigonal prism and the terminal faces of a flattened pyramid and the pinacoid. 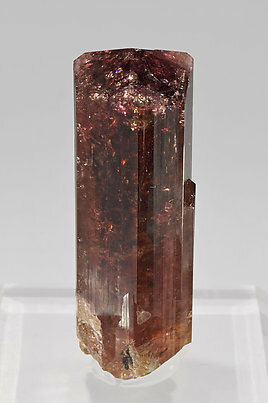 Its color is between pink and red, quite uniform, with slightly violet shades on some prism areas and it is on a matrix of smoky Quartz, with Lepidolite and unidentified feldspar. The sample is from the Desmond Sacco collection, whose label we’ll send to the buyer.